Last week we got to celebrate our baby turning 5! I seriously can’t believe she is 5 already, time sure has flown. She is a spunky, determined, beautiful little princess. She loves all things girly and I absolutely love putting together her birthday parties. It’s like I’m living vicariously through her doing all the girly things I ever wanted to do. 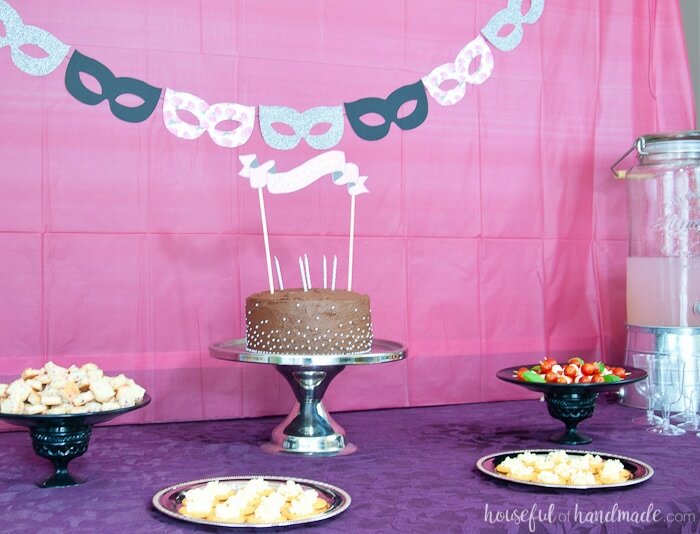 This year for her party, we decided to go with a masquerade ball themed birthday party and it was a blast! Since my daughter is super girly we get to go all sweet and fun with her birthday parties. For her 1st birthday I did everything in baby pink and black with a chocolate Eiffel tower on top of her smash cake. Maybe it’s my fault she is super girly (I always have been). 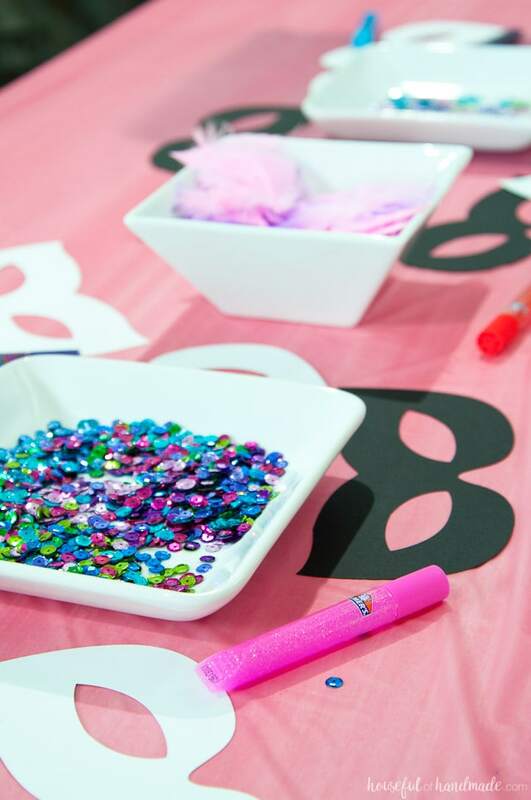 For the parties after that we have done a tea party with lots of delicious treats and herbal teas, a classic princess party, a mermaid tea party with all things under the sea, and then this year with a masquerade ball we have covered so many of the girliest party themes. I don’t know how we are going to top this next year, but luckily I have a whole year to figure it out. Every year as I start planning my kids birthday parties, I keep telling myself I will keep it simple this year, and this time I feel like I finally did. There was just enough party decorations, just enough food, just enough games to fill the time, and lots of leftover cake. And since I was so busy this month, I had to get everything ready in just one day. Luckily for me, there was no school the day before her birthday party so I let the kids waste lots of time in front of the TV while I got all the decorations and food ready and it totally worked. 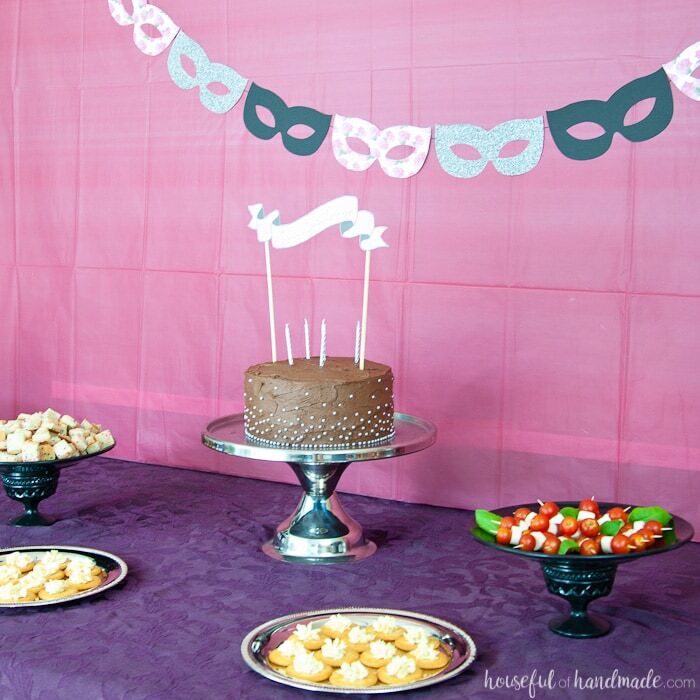 And lucky for you, I am sharing all the details of our masquerade ball themed birthday party so you can easily do it too! This post contains some affiliate links for your convenience. Clicking these links will help support this blog so I can keep creating things to share with you, but you will never pay more through an affiliate link. Click here to read my full disclosure policy. I love using my Silhouette to make decorations for my kids parties and for our home. We love borrowing CDs with princess music from our library for things like this. Birthday invitations might be one one of my favorite things to design and this one did not disappoint. I tried to keep the mystic quality of a traditional masquerade ball, but make it fun and girly since it was for my 5 year old. I used a background pattern of pink roses popping out from behind a black mask. 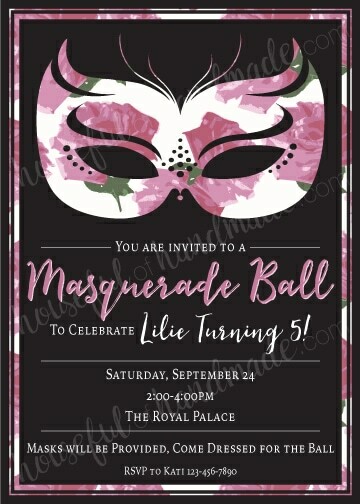 If you want to have your own masquerade ball themed birthday party, I am sharing a blank invitation and the rest of the printables I created for this party in the library of free downloads for my email subscribers. Click here to subscribe and get access to all my printables and downloads. To turn our dining room into a ballroom, I moved the dining room table to the side of the room and lined the chairs up along the walls. Now the kids had room to play and dance. 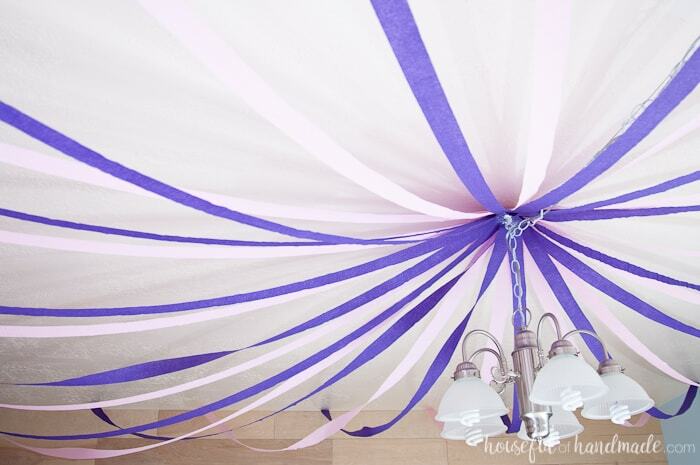 Then I used some crepe paper to create a canopy on the ceiling to really make it look like a ballroom. My daughter was so excited about the canopy, I guess it’s time to put one up in her bedroom. I used the pink roses pattern I designed for the invitation as a jumping off point for the decorations. To make a background for the food table I used pink table cloths and hung them on the wall. 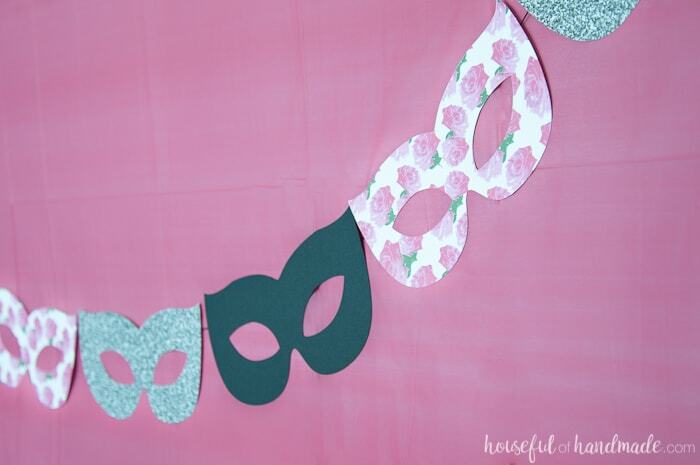 Then I cut out some masks with the rose pattern, some to look like glitter, and some in black. Then I glued them onto a black string and hung it over my background. Now the food table was ready for all the goodies I share below. 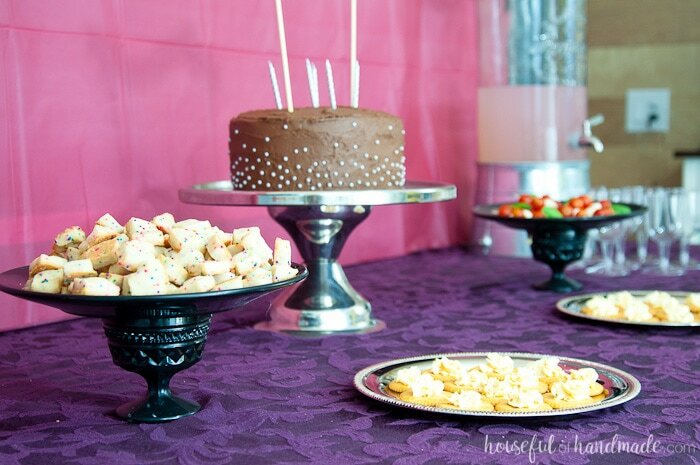 What’s a masquerade ball without a buffet table? I love having a little more for the kids to snack on than just sweets so we added a few savory options to our table too. But I tried really hard to keep it simple so I wouldn’t have to spend all day cooking for a bunch of 5 year olds. 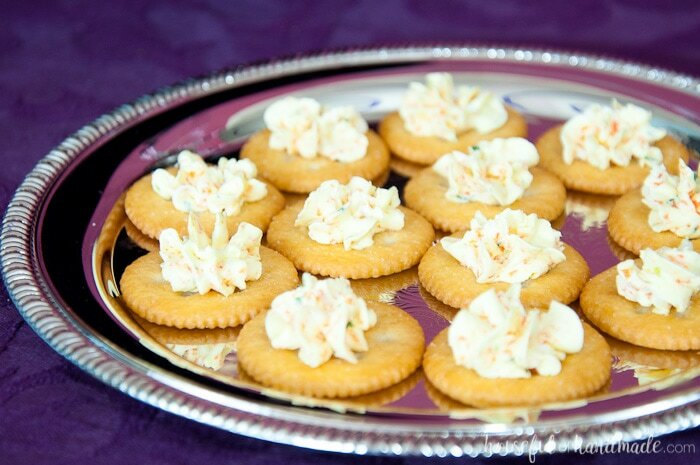 We opted for crackers with vegetable cream cheese piped on top of them (to make them extra fancy). To make the herbed cream cheese, mix a variety of chopped fresh herbs, minced carrots and minced green onion into cream cheese. Then using a large star tip and a piping bag, pipe dollops of the cream cheese on top of the crackers. Plate them and they are ready for the party! For another savory option, and since we have an abundance of cherry tomatoes in our garden, we made mini caprese kabobs. 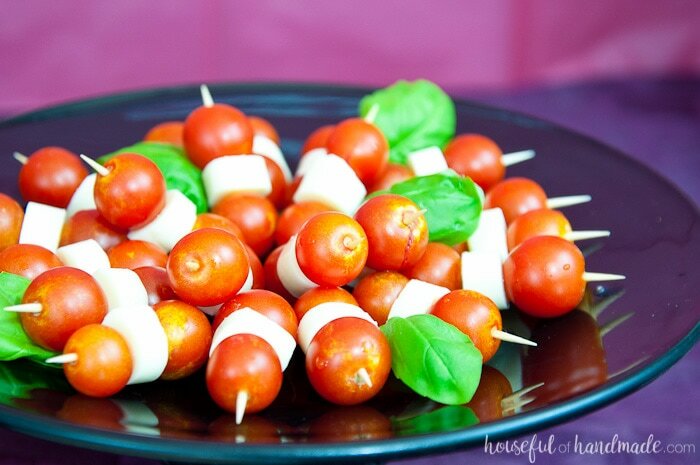 Skewer cherry tomatoes and mozzarella cheese onto toothpicks. I used mozzarella cheese sticks cut into small pieces and to keep it super simple and kid friendly we didn’t put the basil on the skewers, just on the plate as a decoration. And of course we needed something sweet to snack on during the party before it was time to cut the cake. 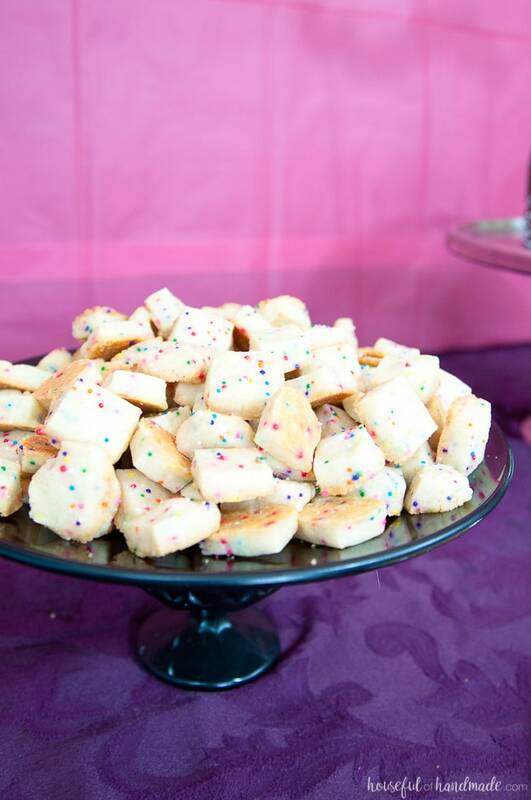 I found this recipe for funfetti shortbread cookie bites from Cooking Classy and knew they would be perfect for all those little fingers. They are also super quick and easy to make and the kids (and my husband) loved them. 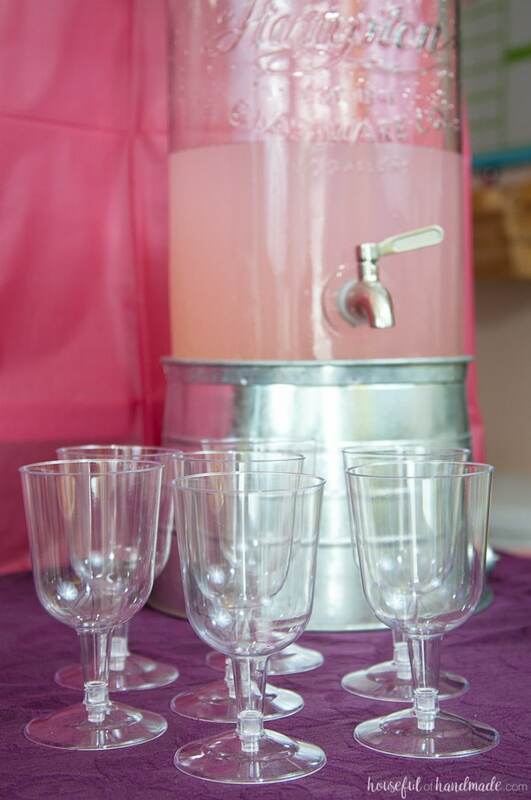 Then for a perfect party drink we kept is super simple with pink lemonade mixed with lemon-lime soda. But of course, we kicked it up a notch by using plastic stemware glasses to serve it in. The girls felt super fancy drinking their drinks with the stemware, I even overheard one little girl saying “This is like a real party!” So cute. At the center of our masquerade ball buffet was the cake! I was really proud of myself for keeping it simple, but luckily we didn’t have to sacrifice beauty. After attempting fondant for my first time with my son’s movie theatre themed party, I relied instead on my favorite trusty buttercream frosting. I made my favorite chocolate cake, which also happens to help me get through the plethora of zucchinis from the garden (I know, it’s surprising that my most favorite chocolate cake of all time is a zucchini cake), in two 9″ circles. Then stacked and frosted the cakes with chocolate buttercream frosting. 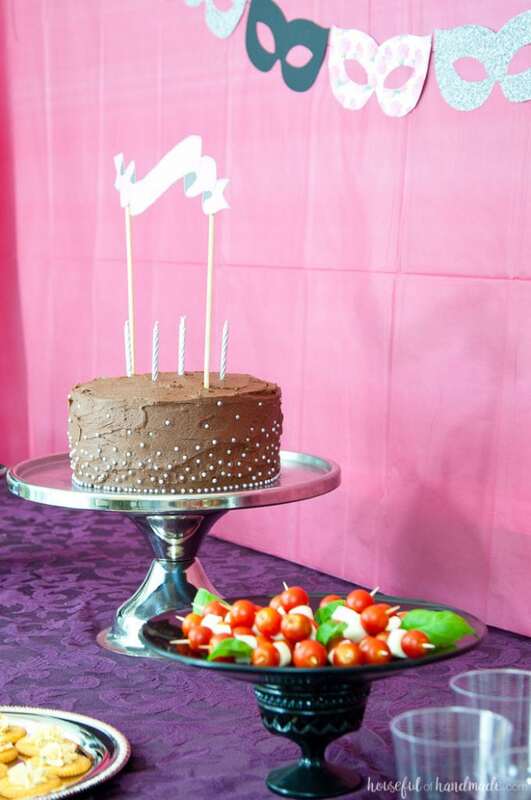 Using silver pearl sprinkles, I placed them around the base of the cake and then up the side. I kept the pearls more dense at the bottom of the cake and thinned them out toward the top for an ombre effect. 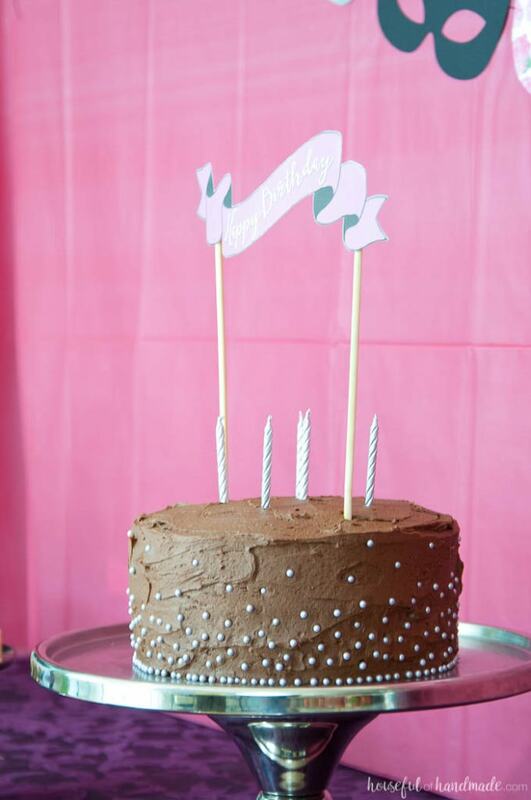 To top off the cake, I made a simple Happy Birthday banner in the pink color scheme (you can download it in my library of free downloads available to my email subscribers, click here to subscribe). I printed it out on a piece of cardstock, cut it out, then glued it to the top of two bamboo skewers. 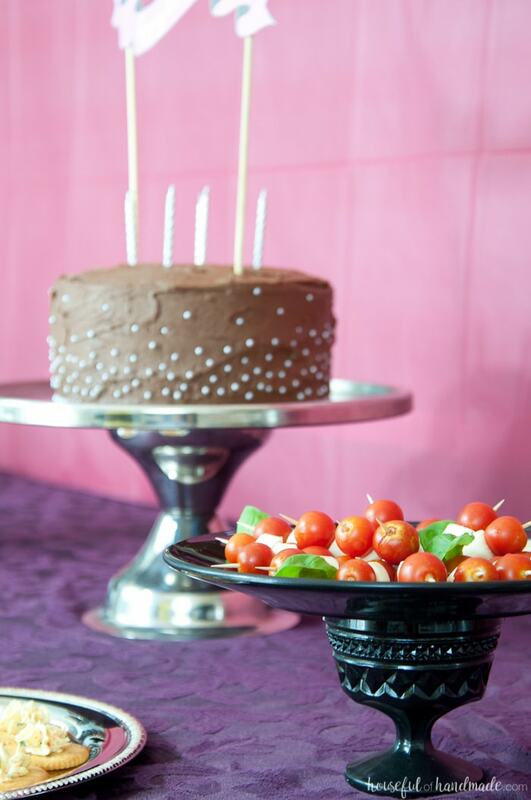 After sticking the skewers into the top of the cake, I finish it all off with some silver candles. I just love how it turned out, a little girly, a little sophisticated, and a whole lot of delicious! Coming up with games to match our masquerade ball theme was harder than I thought. I knew the party would start with the kids decorating their own masks. 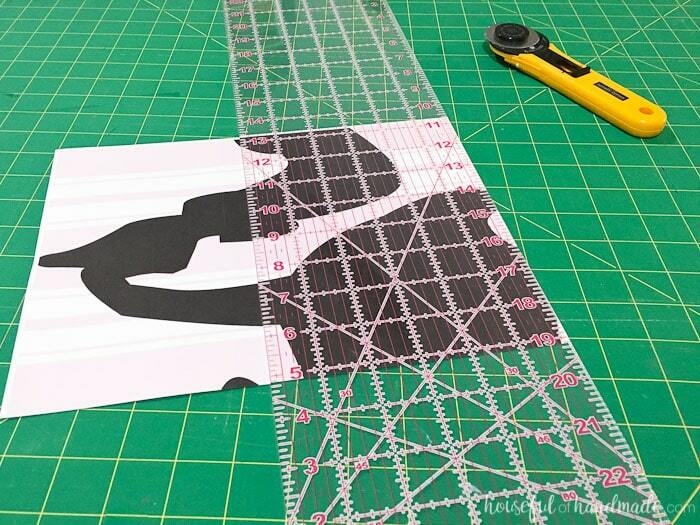 I cut out a bunch of plain masks out of white and black cardstock. Then we let the kids decorate them with rhinestones, jewels, feathers, and glitter glue. However, we discovered that the kids are slightly heavy handed with the glitter glue so it takes FOREVER to dry. Seriously, we had some friends and family stay the rest of the night and after 6 hours, their masks still weren’t fully dry. If you want the kids to be able to wear their masks, maybe find a faster drying glue. Once the masks were dry we either added an elastic string to them for the kids to wear or glued them to a bamboo skewer for the kids to hold (you know when they were finally dried the next day). After the masks were all decorated, they played pin the mask on the ball dancer. 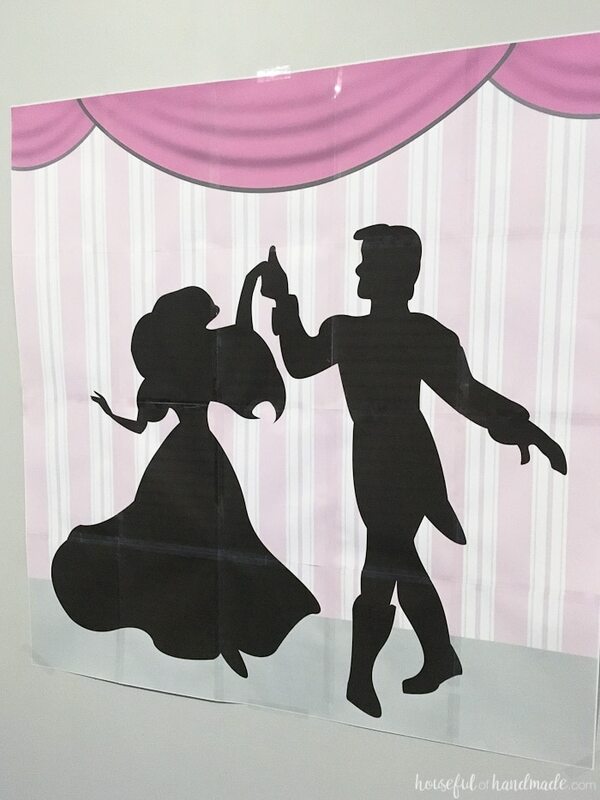 I made a silhouette of a dancing princesses & prince and added some background decoration and a curtain to it so it looked like they were at the ball. I printed the picture really big, it ended up taking 20 pages, and carefully taped them together to make one larger picture. I was worried it would take forever, but it only took about an hour to have it ready to play. Then I cut out a bunch of little masks with the floral background and we spun the kids around and let them try to pin the masks on the dancers. They had such a blast playing we had to keep going over and over. For the final game, I decided to go with a musical game, it is a ball after all. We played musical chairs and it was a blast. The kids were giggling and didn’t want to stop playing. It reminded me how sometimes simple is better and the only planning we needed to do was to have some kid approved songs ready to play. The last game we played was DANCING! After the food was eaten, the cake was cut, and the presents were opened, we turned on some music and let the kids just dance it out. Of course, we made sure to fill our iPod with lots of princess songs and it always makes me laugh when you turn on “Let it Go” in a room of sugar-crazed girls. We were having so much fun, I totally forgot to take pictures. We had such a blast celebrating another amazing year with my daughter. 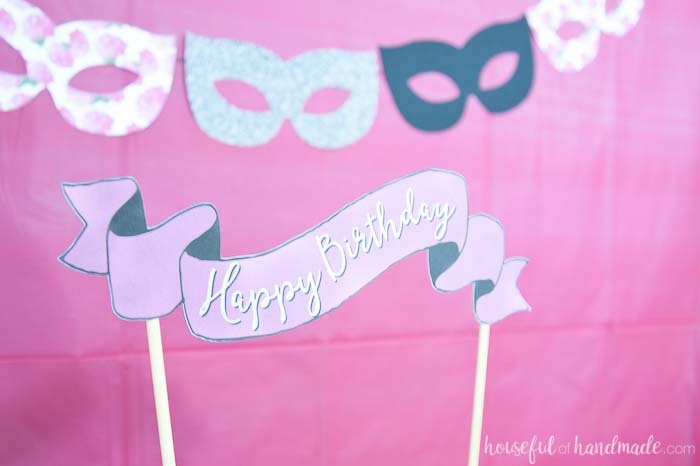 If you want to throw your own masquerade ball themed birthday party, I am sharing all the printables we used for this party in the library of free downloads I share with my email subscribers. Sign up today to get access to all these printables and much more! And now that the party is over, and the decorations are all cleaned up, I am ready to start decorating for Halloween. Stay tuned for lots of Halloween decorations these next couple weeks! 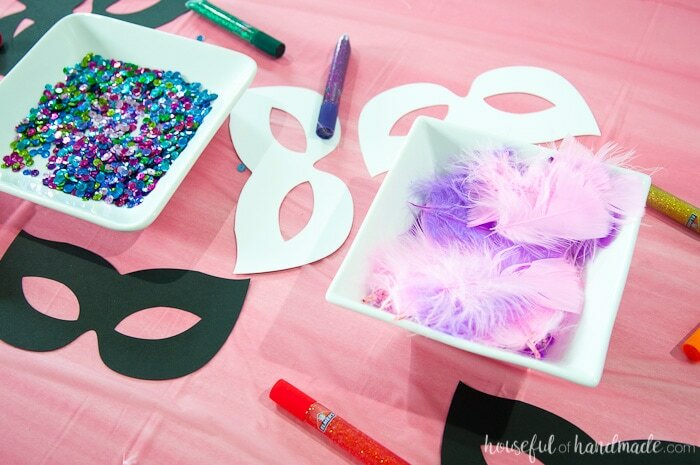 I love the idea of making your own masks as a party activity! Such a fun way to enjoy some creativity and take the burden off of guests to bring their own. 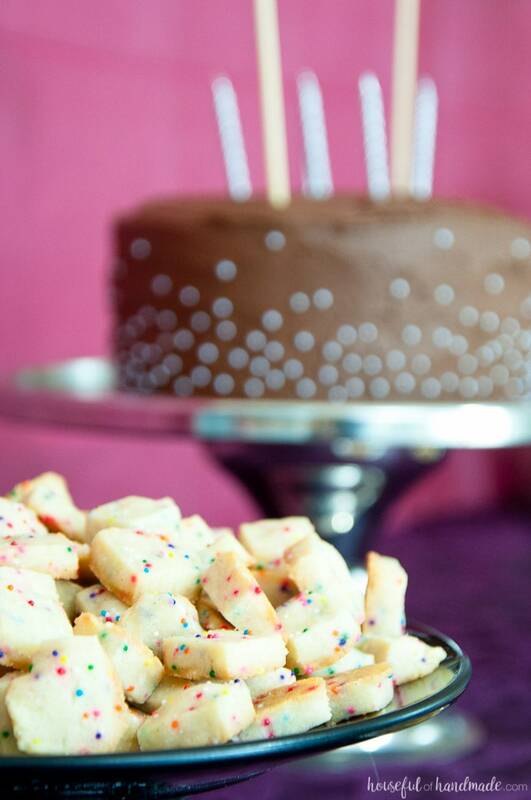 Thanks so much for sharing your sweet party idea with us at Merry Monday this week! Thanks Marie, the kids had so much fun decorating their own masks too. What an absolutely adorable theme for such a sophisticated young lady! I love it! Pinning! This is such a fun theme! I love the streamers on the ceiling! That was my daughters favorite part too. We left them up for over a week! What a cute party theme! I’m sure it was a huge hit! Thanks Amy! It was a lot of fun. What a great theme! I want to decorate a mask and eat funfetti shortbread now. Just the kid in me talking. Seriously, we should all have fun like this even as adults. Seems like everyone had a great time. Ha ha! 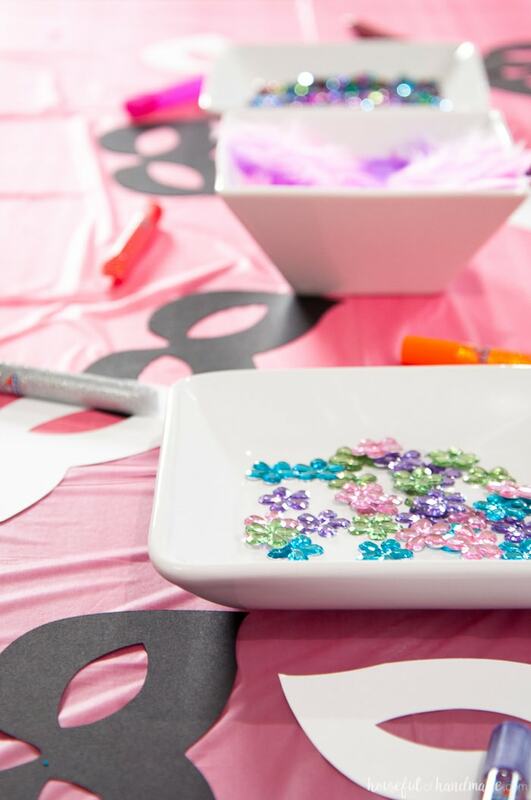 I think I have so much fun making these parties for my kids because I want an excuse to have them. I don’t like adulting all the time! Sounds like a good time was had by all!! What a beautiful party. Thanks Maria. It was a fun party and would be perfect for Halloween too. 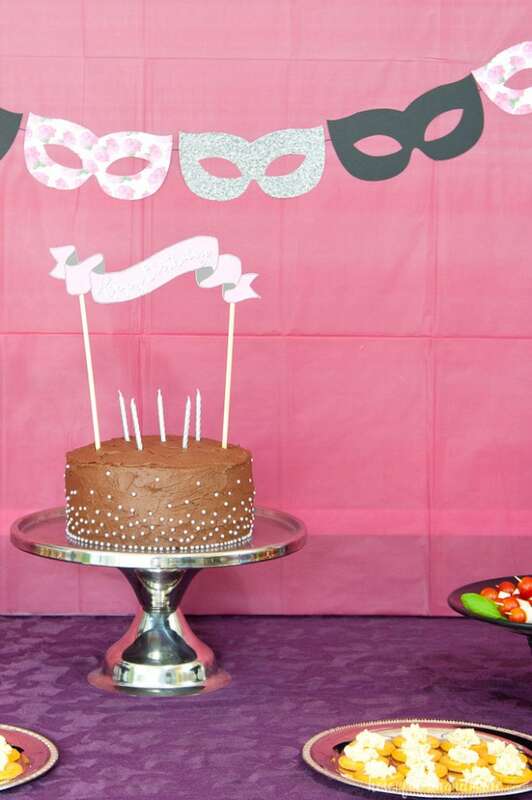 Such a cute party theme! The decorations are beautiful! What a fun party! That cake is so pretty! Oh my goodness, this looks so fun! I love all of the decorations! Thanks Amanda! It was a blast. Thank you! I prefer a theme cause it’s so easy to put together.